Freedom Fighter & Sahakar Maharshi Late. Bhausaheb Santuji Thorat, cooperative baron and great freedom fighter set up 'SANGAMNER TALUKA SAHAKARI DUDH UTPADAK & PRAKRIYA SANGH LTD., SANGAMNER ' at Sangamner district Ahmednagar on 12.11.1977. 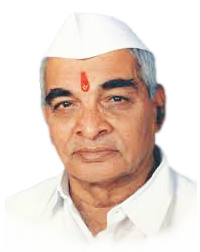 'SANGAMNER TALUKA SAHAKARI DUDH UTPADAK & PRAKRIYA SANGH LTD., SANGAMNER ' was organized at sangmaner (Ahmednagar) in the fag end of 1977 by Freedom Fighter & Sahakar Maharshi Late Bhausaheb Santuji Thorat with a objective of improve standard of living of local farmers, landless laborers, and economically weaker sections of the society through dairy farming. Total milk production in the district is about 21 lakh litres/day in Dec-2012. Of the total production, 20% is collected by cooperatives. Among cooperatives, the union collect is 55% of 6 lakh liters. There are 147 private dairies in district . Efforts were undertaken to develop high yielding crossbred cows for milk production. Considering the less number of crossbred cows in area, A.I. centers were started in association with the Sangamner Cooperative Sugar Factory�and Bhartiya Agro Industries Foundation under the guidance of Late. Manibai Desai. Later on the union took over breeding centers from the Sangamner Sugar Factory. Besides 41 A.I. centers run by the union, zilla parishad, Ahmednager and Government of Maharashtra have also been providing AI and clinical facilities in the jurisdiction of the union. Unemployed youth having livestock diploma are also taking up this profession. Efforts are being taken up for creating awareness on scientific dairy farming through training programs. Besides that, milk producers are encouraged to maintain crossbred cows.